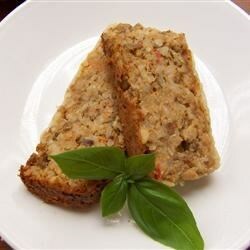 "Brown rice, lentils, bread crumbs, onions and tomatoes are combined with eggs and herbs and baked into a vegetarian version of a mealtime favorite. Sprinkle loaf with shredded cheese and bake an additional 5 minutes, if desired." Preheat oven to 325 degrees F (165 degrees C). Cook lentils and brown rice according to package directions. In a large bowl, mash lentils. To the lentils add wheat germ, bread crumbs, brown rice, eggs, onion, thyme, tomatoes, ketchup, soy sauce and cheese. Pour into loaf pan. Bake, covered, for 1 hour. Discover the secret to turkey meatloaf with the perfect texture.